Heather Knight’s nesting bowls appealed to me on many levels. First, the contrast between the very tactile outside surface and the smooth, glass like interior is so beautiful. 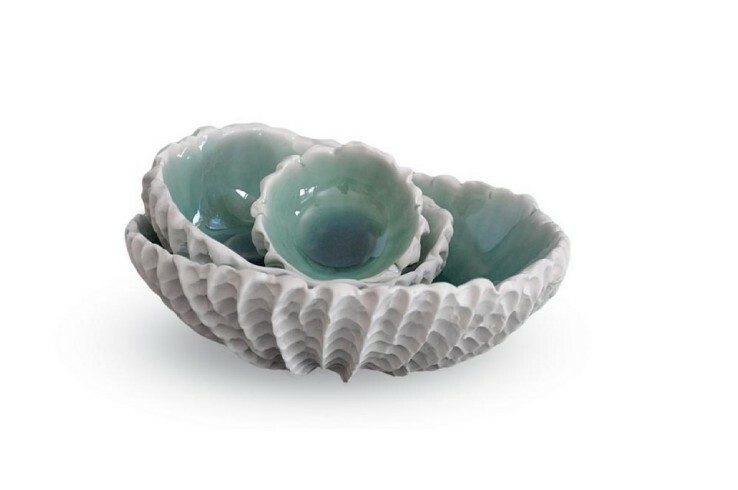 The modeling and texture of the outside of the bowls suggest seashell forms or ancient stone sculpture that has been worn by wind and water. On the inside there is a protected very slick surface. Secondly, the color. The outside is a very matte white that has great depth and inside there are shades of beautiful blue greens that could almost be pools of water. While the three bowls could function in a utilitarian way, I find them very sculptural and a little above holding peanuts and dip. They are beautiful to examine and wonderful to touch. I look forward to seeing what Heather Knight brings to this year's show. "Winter Show" opens with one of Greensboro's most popular holiday season events: the Collector's Choice fundraiser on December 6 at 7PM. The fundraiser provides a rare opportunity to truly become engaged with the very best art North Carolina has to offer. Participants have an advance opportunity to purchase pieces in "Winter Show" before they are available to the public and meet and mix with the exhibiting artists over food and wine. Tickets are $70 for members, $85 for non-members and $90 at the door. Reserve your tickets by November 25 online HERE.